The Project Team will be running a series of Open Days at the High Pasture’s site from Monday 2nd through to Saturday 14th October 2006, which will form a part of the Highland Archaeology Fortnight (see leaflets and booklets advertising this event at your local libraries and Highland Council Service Points). Discover how archaeology can enhance our understanding of the prehistory through excavation and craft reconstructions. 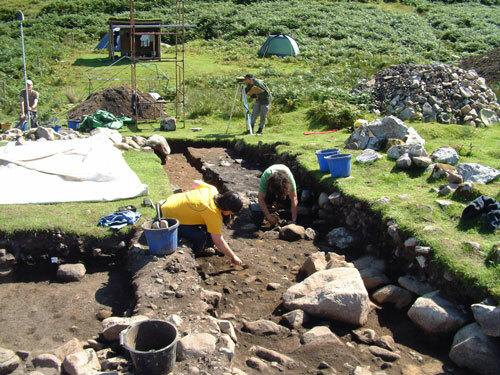 Guided tours of the excavations and on-site displays will provide a background to the archaeological fieldwork, while Highland Council Ranger-led guided walks will explore the wider natural and archaeological landscapes. The Highland Council Rangers will also be hosting activity days at the site targeting a younger audience, in which children (or adults) can have a go at jewellery-making, pottery and other crafts, with face painting for the more adventurous! 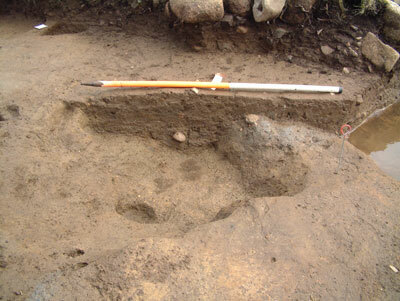 13/10/2006 - Columba 1400 Centre, Staffin, Skye - Investigating the Prehistory of Skye - Recent Archaeological Fieldwork (University of Aberdeen Evening Lecture Programme). 14/10/2006 - Ramada Jarvis Hotel, Inverness - High Pasture Cave & Environs Project - Recent Developments. This lecture is within the programme of talks planned for the What’s New in Highland Archaeology Seminar, which will take place in Inverness over the 14th and 15th October. Meanwhile, fieldwork at the High Pasture Cave site has made some good progress, finishing the excavations in Trenches 6, 7 and 10. Trench 10, which was set out to investigate a potential buried wall for the ‘roundhouse’ feature, has now been excavated down to the natural clay. No wall was found in this trench. What we did find was a haphazard pile of granite boulders covering a fairly clean brown soil, which had formed over the top of a thin, but compact layer of fire-cracked stone and pebbles. Below this layer was more clean brown sediment, which lay directly on top of the natural karstic clay. This had a few outcrops of natural limestone bedrock showing through and within the clay we noticed several potential cut features that had been filled with a darker sediment. On excavation most of these turned out to be natural hollows filled with the overlying sediment and rat tunnels, but the excavation of one feature revealed a fairly deep pit that had been cut into the clay. 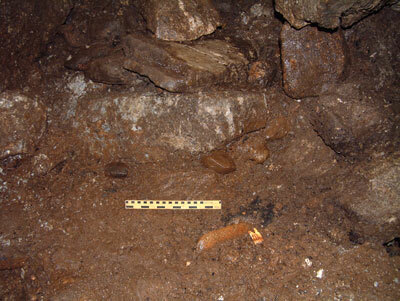 The pit contained a fill of mixed sediments containing small flecks of charcoal, but no finds. However, the charcoal recovered from the pit will allow radiocarbon submissions to be made, and this should provide dates for this feature. Although no finds were recovered from the pit feature, George Kozikowski did find a small sherd of pottery from a shallow scoop feature in the trench. 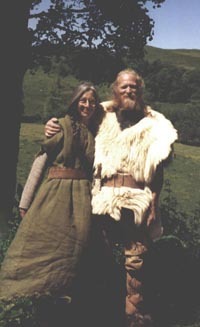 The fabric and quality of the pottery was quite different to the more usual ceramic assemblage recovered from High Pasture’s, and may relate to the use of the site during an earlier period of prehistory. Trench 6 has now been excavated down to the natural limestone floor. When we first started excavating the trench in 2005 access was on hands and knees in this sector of Bone Passage, but now there is ample room to stand upright. The excavation of the lower archaeological deposits continued to produce a wealth of small finds including spindle whorls, bone pins and coarse stone tools, many of which were located in close proximity to the bottom two steps of the entrance stairwell. Animal bone and burnt bone was also recovered, but as we excavated deeper down towards the limestone floor washed gravels and cobbles were exposed, which appeared more natural in origin. A small alcove under the southwest wall of the cave passage at floor level was filled with these natural-looking deposits, but we continued to find a few small fragments of bone. However, the most exciting finds from the alcove were two small sherds of pottery, both of which showed some chevron/lozenge-style decoration. The pottery was well-fired and had been blackened by the natural deposits in which they were found. These ceramics, like those found in the shallow scoop feature in Trench 10 mentioned above, appear to be from earlier prehistory and could be Early Bronze Age or Neolithic in date. If so, then we may have evidence for the use of the cave some 3500 to 5000 years ago. Like the other materials recovered from the site, the pottery will be analysed by specialists who should be able to identify the material with more certainty. 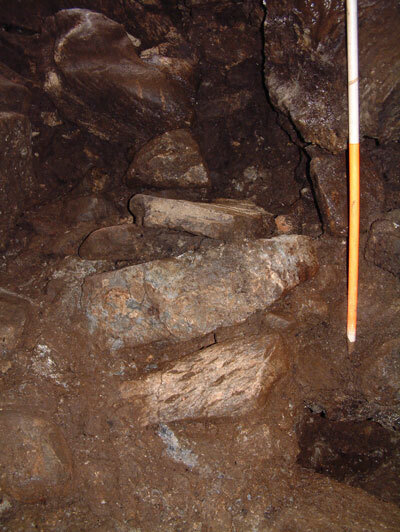 The image above shows the lower archaeological deposits in Trench 6 and the bottom steps of the stairwell. Animal bone is littered across the surface of this context, while the large item near the scale (scale=0.25m) is a granite quern rubber. 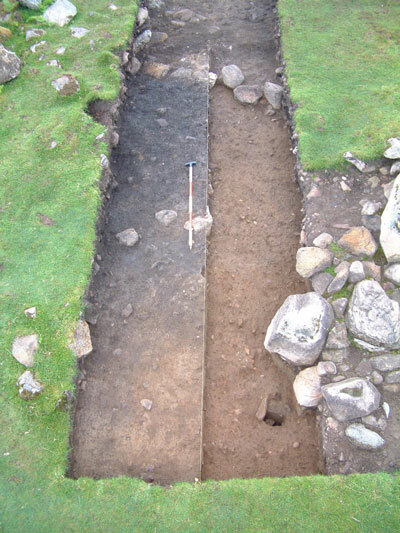 The image below shows the bottom steps of the stairwell after excavation. A significant number of small finds were recovered from this liminal location in the cave, where the man-made stairwell meets the natural cave (scale=1m). Details of the finds mentioned in this site entry can be found in the Latest Finds page. The material includes several objects made of steatite or soapstone. 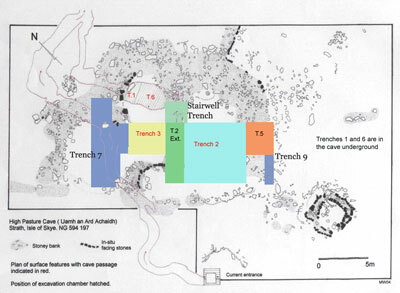 Work at the site will now focus on Trench 11, a new trench to investigate the U-shaped structure that dominates the core area of the site, and on excavating trial trenches to investigate anomalies identified through the recent geophysical surveys. Therefore, site volunteers are still required to assist the project team with this work. 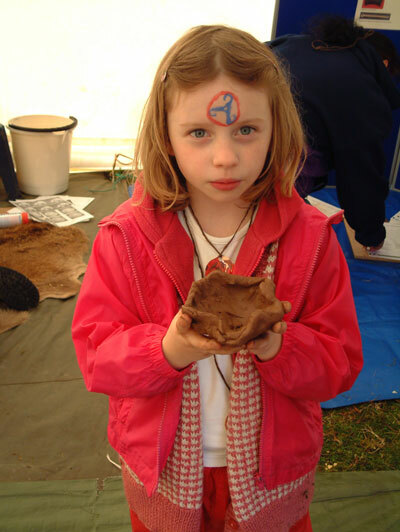 My daughter, Iris, visited High Pasture Cave with her school (Struan Primary) in October 2006. She thoroughly enjoyed the day and said it was the best school trip ever, and she also enjoyed John and Val’s demonstrations. After her visit I went on your website and found it not only informative but also very interesting and the virtual tour was cool. My daughter and I hope to visit next season. Thank you for the time you spent talking us through your work last Monday. Good luck with the project. We will be following progress with great interest. Hope the carbon dates on the burial fit with the possible Brigid connection. Looking forward to renewing our friendship again on the high pasture cave front and telling you of our recent finds and discoveries.